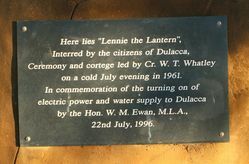 A memorial commemorates the site of a lantern buried to commemorate the turning on of electricity and water supply to Dulacca in 1961. The memorial was unveiled on the 35th Anniversary in 1996. Saturday, 22 July, 1961 was the day marked for the official Switch-on Ceremony for the two small townships of Dulacca and Drillham. During the afternoon, there was a big programme of events at Dulacca. A ‘monster sports afternoon featuring basketball, softball, football, athletics and a motor gymkhana’ started off the day’s celebrations and a ‘married versus single’ football competition provided extra fun. Since Dulacca was without its public hall following a damaging cyclone in 1960, an evening dance was held at the Drillham Hall after the Switch-on Ceremony in the towns had taken place. 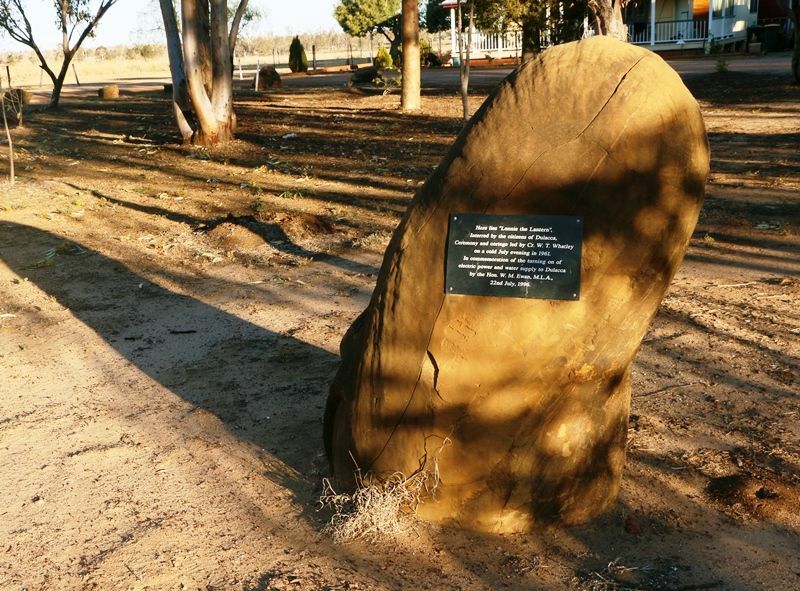 The Switch-on for Dulacca was scheduled for 7pm and it was a dual celebration for the town since it was also the opening of the town’s new water scheme. on a cold July evening in 1961.